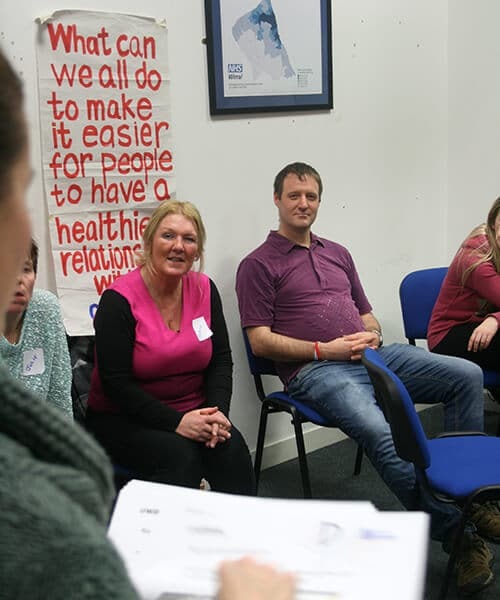 The Wirral Alcohol Inquiry, commissioned by Wirral Borough Council and led by Peter Bryant and Nick Beddow, brought together a group of local residents to try and answer the question: "What can we all do to make it easier for people to have a healthier relationship with alcohol?" Over nine sessions, 20 local residents were encouraged to think and talk about alcohol in their own community. Residents were recruited from four different constituencies within the Wirral. Recruitment was through letters through doors via voluntary sector and community organisations and street work (talking to people on the street, outside schools, at bus stops etc). The group consisted of people with direct experience of alcohol harm and those with none. In the first session the group used participatory tools such as mapping and problem trees to talk about local assets and barriers. In the remaining sessions commentators were invited to present to the group on the issues prioritised by them during the first session. Equipped with red cards – in order to challenge any jargon or complex language – the group ‘cross examined’ the commentators before a period of deliberation. During the last two sessions the group produced a set of 21 prioritised recommendations. Running parallel to the inquiry, and in keeping with good practice for a deliberative process, was the Wirral alcohol inquiry oversight panel. This group of key stakeholders (including councillors, representatives from the police service, the Chamber of Commerce and the local Clinical Commissioning group) met to ensure fairness and rigour in the process and to consider how they can best implement the recommendations of the group. Jury members presented their recommendations at a launch event on 29 February 2016 They aim to continue to meet to take action and push for the recommendations to be implemented.